A quick post to show the latest development progress on ParaJVD. can be resized/docked/moved around to match the user preferences). This view shows an histogram of the CPU cycles elapsed during the last frames. In its top-left corner, there is also a cycles counter (a kind of progress bar) for the current frame, and also a sub-counter (the figure at the right) that displays the number of cycles needed to execute the last debug step. Another new view has been added : the Watches view. The user enters Watch Expressions that can either be resolved as values or addresses. If it's an address, then the "content" column shows the bytes at the specified address (these bytes can be edited, just like in the Memory views). The "content" column displays the values on a yellow background when it was modified during the last debug step. The watch view is now roughly working, but there are still a bunch of issues hanging around, so it requires yet more work to be fully completed. (At the moment, the only way to change the binaries/sources loaded at startup is to modify a couple of ParaJVD source files ... not exactly my definition of user-friendly!). 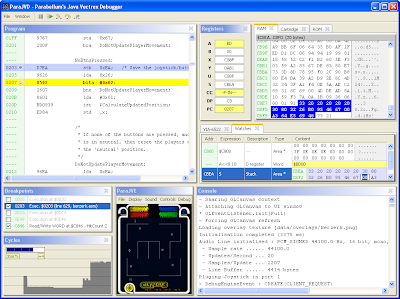 After that, the debugger can be released as a preview for the thousands of Vectrex homebrew developers out there. looks great! keep up the good work.